The Cook Islands Palladium Coin is one of the world’s most famous Palladium bullion coins. Highly prized by investors and collectors it is commonly bought as a safe haven for capital or as a valuable addition to a coin collection. Each coin contains 1 troy ounce of 999.5 pure palladium and measures 32 mm in diameter. Each Cook Island Palladium is noted for its detailed depiction of the sailing ship known as HMS Bounty. 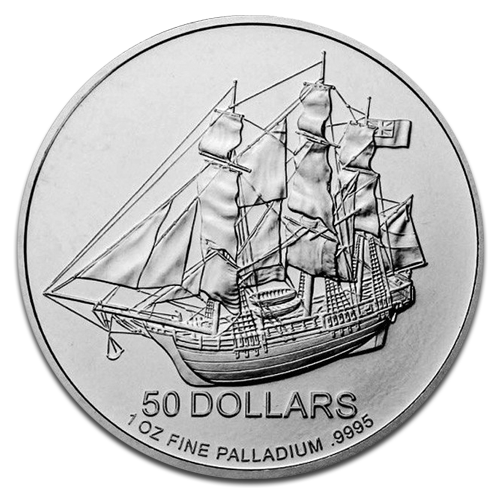 The famous ‘mutiny on the Bounty’ took place in south Pacific waters in April 1789, and many collectors purchase the 1 oz Cook Islands Palladium Coin for its historical connotations. The coin also shows an image of HM Queen Elizabeth II along with the year it was minted. This beautifully minted coin is legal currency of the Cook Islands with a face value of $50 although its worth as an investment is considerably more. Why buy Palladium coin with CoinInvest.com? 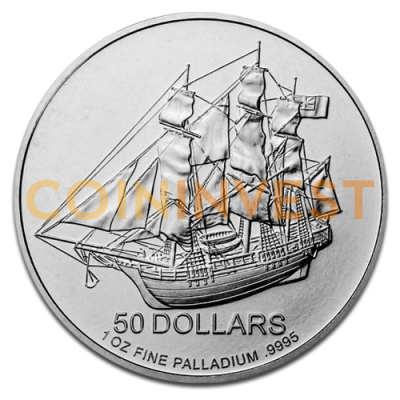 As a leading trader in bullion coins and precious metals, CoinInvest.com is able to obtain unique items like the Cook Island Palladium 1 oz coin in larger quantities. This enables us to offer this thrilling bullion coin at the most competitive prices. All orders are shipped quickly and securely packaged.